The annual NHL Prospect Tournament wrapped up this week as teams prepare for and open training camps around the country. The St. Louis Blues were once again well represented in Traverse City, finishing third with a 3-1 record. Several top Blues prospects and draft picks participated and we’ll see a few of them when camp opens here in St. Louis this weekend. Ready for the Big Club? 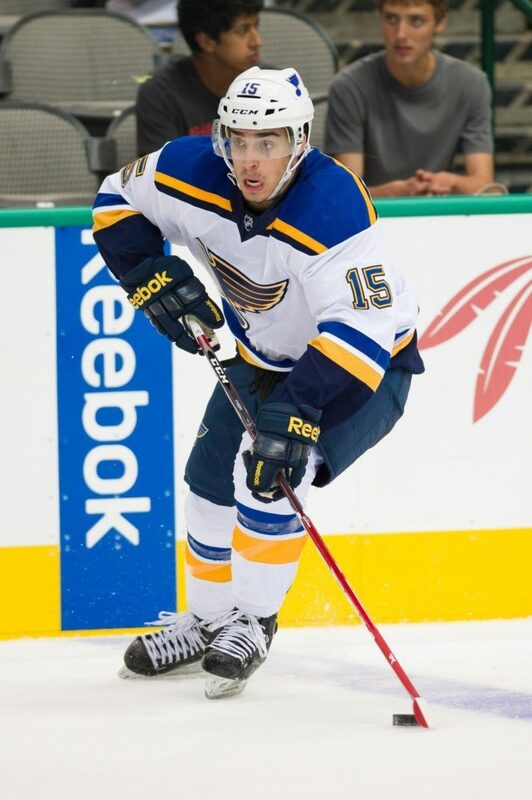 Robby Fabbri, a first round draft pick of the Blues in 2014, showed once again that he’s got the skills to rise to the top of the pack. 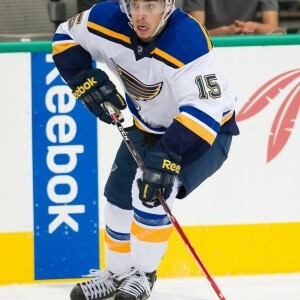 Fabbri had a nice assist in a game one loss and went on to score three goals including two in just 10 minutes in the Blues 5-1 pounding of Carolina in their final game. At 5’10” and 170 pounds Fabbri comes into camp on the smaller end of the scale among forwards but he makes up for it with speed and puck handling ability. He sees the ice and has the kind of innate hockey sense that can’t really be coached. His upside in the NHL is huge, but is he ready for the professional stage? Unless the Blues think he can consistently play top six minutes he might be better off returning to Guelph, but I think he makes the St. Louis squad out of camp this year. Defenseman Colton Parayko was the captain of the Blues prospects team and led by example. Parayko played up to his size (he’s 6′ 4″, 195 pounds) and continued to impress fans and coaches alike with his strong defensive zone presence. He also netted two goals including a power-play tally in game three, building on his success from last season when he made the jump from NCAA hockey to the AHL and posted four goals and three assists in 17 games for the Chicago Wolves. With Robert Bortuzzo, Chris Butler, and Petteri Lindbohm the likely candidates to round out the Blues defensive corps this season, Parayko will be with the Wolves again but is potentially a top candidate for a call-up should St. Louis sustain multiple injuries. He’ll get the chance to further impress St. Louis in training camp starting this weekend. Touted as a future top four d-man, Parayko is poised to pounce on the NHL and the Blues should be very happy with his development. St. Louis native, goaltender Luke Opilka, posted a shutout in the Blues game two victory and made it clear St. Louis used their fifth round pick in this year’s NHL Entry Draft wisely. The club signed Opilka to a 3-year entry-level deal and paved the way for the 18-year old goaltender to begin his journey in the professional ranks. The addition of Opilka to the stable of young goaltending prospects in the Blues system gives them a very nice list of young netminders. He’ll likely play in the OHL this year but will be in training camp along with Jordan Binnington, Phoenix Copely, and Nicklas Lundstrum. Having future Hall of Famer Martin Brodeur in the organization may help this group grow even more quickly than expected. St. Louis will open camp this Saturday, September 19, the first of two days fans will be able to come see these three up-and-coming players along with the rest of the Blues and Blues hopefuls for themselves. If this year’s prospects tournament was any indication, the future has a lot to offer.